Our bounds shall be the girdling seas alone. During the earliest beginnings of our modern-day Australia , the exploration and study of the southern skies were deemed a priority. This whole region surrounding the continent was later dubbed by the British as ‘The Antipodes’, as on the globe it is placed almost diametrically opposite to the United Kingdom. Most just considered the location as terra incognito — an unimaginable place of exotic fauna and flora; and for some, a fearful place to be sent for confinement in its penal colonies. Others saw this new land as a great opportunity. Moreover, from the astronomical perspective, the southern skies were also scientific attractive because they remained invisible to the northern populations. Here was the stunningly bright southern Milky Way and the two Magellanic Clouds, that has no real counterparts anywhere else across the Heavens. Much has been said in the old and recent astronomical literature regarding the early historical aspects of Australian astronomy. In importance there are probably three significant events to note during this time; namely, the observations by James Cook in Tahiti for the Transit of Venus, the establishment in 1788 of the first temporary observatory at Dawes Point on the foreshores of Sydney, and lastly, the many transit observations and southern star catalogue made between 1821 and 1826 by Governor Sir Thomas Brisbane, and his two assistants; James Dunlop and Charles Rümker at Paramatta Observatory. Although these three mark noteworthy events, in our astronomical annals there is a huge gap of fifty years spanning these milestones. This is one whole generation; from the initial European discovery of the eastern coast of Australia by James Cook and followed by its subsequent founding, on 26th January 1788, of the first European settlement at Sydney Cove. Most histories tend to generally gloss over the navigational and astronomical importance of these times. This is peculiarly and narrowly bound to just either Lieutenant William Dawes, and even by some, at the establishment of Paramatta Observatory in the 1820s. Writers also tend to fall into the easy trap of just applying narrow presentism-like attitudes towards these times, by perceiving the astronomical importance of these explorations as either being minor steps to our current knowledge or reduce them as just arbitrary affairs of interesting or occurrences in the overall perception of Australian history. There were indeed some sporadic astronomical observations made from Australian shores, in which, the future foundations of observational astronomy in this country was first entrusted. It also served the British Empire well to safely laud and claim whole possession of these lands by improve techniques of sea navigation based on instrumentally observing the Sun, Moon, planets and stars. Together, this becomes the basis of much of the overall content of this general article. In their seemingly timeless occupation of the Australian southern continent, and even before there was any real European contact, the indigenous Aboriginal peoples understood the importance of the sky, and knew very well of the general movements of the Sun, Moon, planets and stars. This view was significantly reinforced and continued with in their own broad ancient allegorical myths and stories that are collectively known to all current Australians as the ‘The Dreaming’ or Dreamtime, first coined by Francis James Gillen (1855-1912) in 1895. Today, these rich oral traditions have been passed down the generations, to remain centrally important to the Australian Aboriginals’ own particular unique view of the cosmological and spiritual creation of their World. Some of these unique mythologies were localised to many regions of Australia, and varied quite significantly between each of the 400-odd tribes existing across the whole country. They are sometimes detailed and elaborate stories generally associated with explaining the local terrain or the changes of the seasonal vegetation and fauna, etc. Yet none of these unique cultural mythological stories appear in written form, but instead were orally passed down through countless generations spanning untold centuries or millennia. Many of these stories are often offered as symbolic or metaphorical myths. They do commonly reflect upon either some general or very specific forgotten historical events, and accordingly, to their moral and cultural values applying to nearly all indigenous Aboriginal peoples. These allegorical stories were also very specifically created to make necessary connections between the Australian Aboriginals and those supernatural beings, who either occupied or lived in the earthbound or heavenly realms — mostly as powerful ancient sprits or from their distant historical ancestors. Many of these stories are about the supernatural transformations of gods or people into native creatures or the naturally observed phenomena. In doing so, this gave them some widespread cosmological explanation of the diverse kinds of changing events seen across the land or that appeared in the sky. Astronomically, this gave their origin, outlines or unique characterisation of celestial events, including the appearance of the bright stars, constellations, the Milky Way; or the visible planets, irregular appearance of comets and the streaks of light produced by meteors. Like most of the ancient cultures worldwide, the local Aboriginal peoples knew how to roughly predicted or anticipate common weather phenomena. This was achieved by just observing the general regular and periodic behaviour of the plants and wildlife within the regional environment itself. By usefully comparing this with the rhythmic annual or seasonal positions of the brightest stars, coupled with learned knowledge by many, many generations of experience, left these indigenous inhabitants across the whole continent with very real and practical uses for natural or astronomical phenomenon. For example, the traditional grasp of the complicated and seemingly multiple Australian seasons, like the annual division of the ‘wet and dry’ (monsoon and dry) in the ‘top end’ of northern Australia. Others knew exactly about these even more subtle observed seasonal changes during these regular seasonal transitions. Furthermore, such practical guidance allowed the Aboriginal peoples to know when or where to hunt, or when to search for certain important animals, seasonal foods, fruits, vegetables or even bush medicines. Knowledge also extended to environment management by using bushfires to regenerate the land at certain times of the year, or when to move on in their nomadic existence to prevent the over use or unsound exploitation of their environment. Such connections also allowed them to establish the onset of various subtle and sometimes potentially dangerous local and regional weather patterns. I.e. Like frequent comings of tropical cyclones or storms. From this unique and intimate relationship with the natural environs has come the general notion of their deep personal relationship that traditional Aboriginals have with the land and sea. Such thoughts continue as important issues for the Aboriginal people in Australia even today. Our modern story of Australian history importantly begins in 1769 with the first voyage of discovery by the renowned English ocean explorer, Lieutenant, then later ranked, Captain James Cook (1728-1779). Unlike many of his 18th Century contemporaries, Cook proved to be both the diligent and capable navigator. He was personally very interested in exploration and willingly worked towards the continued advancement of natural history, geography and science. His own British Royal naval career was already quite extensive and well practised, having already done military service between 1756 to 1763 during the European Seven Year War. From about June 1755, James Cook in his youth had already learnt much about seamanship and command, but what came immediately obvious to his superiors was his true capabilities and natural naval prowess. This competence was to come to the fore in sea navigation coupled with notable map making skills, and he easily achieved the required precision needed for geographical cartography and surveying. An early example of this expertise was demonstrated in the considerably difficult task of mapping some of the eastern coast of North America. During the early to mid-1760s, Cook undertook the more difficult mission task of mapping the island of Newfoundland, the wide entrance to the Saint Lawrence River, and much of the surrounding seaway between present day Canada and United States of America. 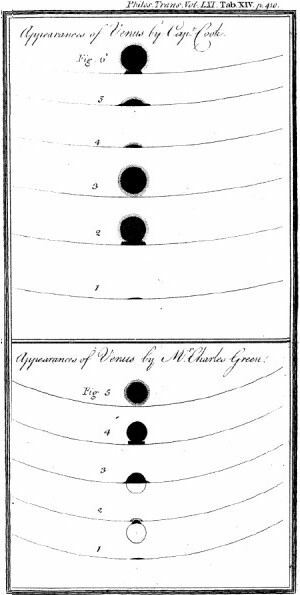 During 1766, Cook was formally recruited by the Royal Society in London to observe the then upcoming Transit of Venus on 3rd June 1769. This grand expedition was to soon hold the ultimate prestige and fame for Cook, who was to eventually to outstrip his already deserved and unsoiled reputation. Culmination of these early efforts was soon validated when he was formally assigned personal command of the converted 370-tonne coal collier ship, HMS. Bark Endeavour, with its compliment of ninety-four crew. This also included several prominent scientists of the day as notable passengers, with three skilled botanical artists. Most prominent passenger to travel on the voyage was the famed 18th Century amateur naturalist and botanist, Sir Joseph Banks (1743-1820), who had paid for his own passage and his small entourage. With Banks was the renown Swedish botanist, Carl von Linné (Carolus Linnaeus) (1707-1778), along with the Finnish naturalist Herman Spöring (1733-1771) and Swedish zoologist, Daniel Solander (1732-1782). The only recognised astronomer for the voyage was the skilful 33-year old Charles Green (1735-1771) who was assigned by the Royal Society to do astronomical observations in the southern hemisphere. Green’s primary task was to observe the Transit of Venus. He was also required to view the Transit of Mercury and do other astronomical observations regarding navigation. He also made many exact longitude determinations, and trialled a new technique using the lunar distance. Some of these observations were also later employed to verify the astronomical predictions of the sun and moon, as they appeared in the first Nautical Almanac of 1767, which as produced by the Royal Greenwich Observatory and H.M. Nautical Almanac Office. Green was also responsible for telescope maintenance, marine navigational instruments, and the clocks and chronometers. He was once employed as a teacher, being brought to the attention of the Admiralty, and was then employed by them. Appointing Cook soon proved to be a wise decision. His broad scientific interests were extremely valuable in trying to meet most of the noteworthy objectives and goals expected from such long exploratory voyages. This was suitably enhanced with him being able to converse on similar levels with all the naturalists and scientists onboard ship. Better still, he provided proper understanding of the required methods to be employed and of the care often needed to gain the best results. Considering the absolute authoritative power given to most British navy ship commanders, ranging from crew moral, decision making, or inflicting punishment towards transgressors, Cook proved level-headed and genuinely liked. Historically, some ship commanders and captains sometimes wilfully neglected their mission objectives, instead unwisely often abusing their given lawful authority over all the crew and passengers. Cook temperament for this mission was ideal. Such an agreeable marriage of sorts proved to be very valuable towards this eventual success of this mostly investigatory expedition. 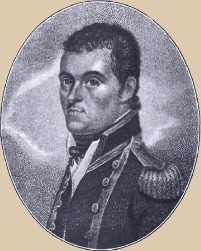 No doubt this is why Cook was later, and almost immediately, given two more additional Pacific commands as top explorer, par excellence of the late 18th Century. During this quite lengthy sailing voyage, the scientific men aboard enthusiastically discovered, recorded and collected many new specimens of various types of flora and fauna that they encountered. They also carefully documented the entire voyage for prosperity and were to later published their many new and unique discoveries. Most of these collections returned to England for further study and examination, usefully increasing much of the general knowledge of then unknown parts of the antipodean world. Some of this exotic romance of these amazing works were to entertain the British natural philosophers. They also grabbed the interest much of the general public in England and also throughout Europe, all being overly surprised, astonished, or even sceptical, with the completely foreign or quite outlandish character of the whole Antipodean region. Such real fascination did continued well into the 19th Century and the Victorian Era. 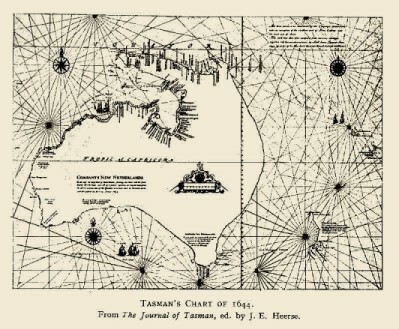 Map made by Tasman of then known Australia, New Guinea and New Zealand as of 1644. This appears in his later published version of Tasman’s Journal. Interestingly, the whole of the southern, eastern, and lower western portions of the Australian continent are completely missing. Also at the time, Bass and York Straits were not then presumably known. There are some tantalising questions here, like the relative completeness of the Gulf of Carpentaria and the realistic outline of southern Western Australia (not visited by Able Tasman!) Was this a good educated guess or of some deeper knowledge that we do not know about? After leaving the beautiful island of Tahiti, Lt. Cook, as ordered, then travelled further south and west to try to find the edge of the presumed fabled great southern continent. He found no indication of land, so Cook the began his next part of the mission, which was to explore New Zealand and see if it was the northern portion of this fabled lost continent. New Zealand, along with Tasmania, had been earlier discovered during 1642 by the Dutch explorer Able Tasman (1603-1659). His ship christened the Heemskerck was searching, in this then unknown part of the world, for new commercial opportunities. At that time, only the islands of northern half of western New Zealand and the southern part of Van Diemen’s Land (Tasmania), were known to exist at these southern latitudes. Tasman himself, however, had not properly confirmed this view. The Māori name Aotearoa, in some views, has been understood to refer just to the northern island, though it often popularly interpreted as meaning the ”Land of the Long White Cloud”. Aotearoa is also the name for the companion satellite galaxy of the Milky Way, the Large Magellanic Cloud (LMC), that appears nearest the zenith during the summer months. It is also known to the Māori as Matanuku or Ngā Pātari Kapua [The word Kapua also meaning ‘cloud’], while the Small Magellanic Cloud (SMC) is called Ngā Pātari Kaihau. Collectively they are just the Ngā Pātari. Cook then arrived in New Zealand on 8th October 1769 at Poverty Bay on the eastern North Island, close to the present city of Gisborne. He soon then found that the territory was occupied by the Polynesian Maori (or Māori) who instead knew New Zealand as Aotearoa. Sailing northward along the coast line, Cook on 3rd November, the ship lay anchor in preparation of another astronomical observation, this time being the Transit of Mercury predicted for 9th November. 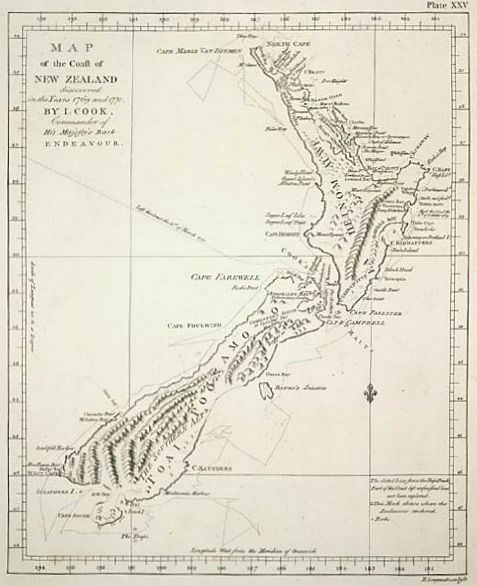 Here Cook lay claim of New Zealand under the name of Great Britain, and called the anchorage, in homage to the transit event, as Mercury Bay. This is near the present seaside city of Whitianga, on the Coromandel Peninsula, lying some seventy-seven kilometres due east of of the largest New Zealand city, Auckland. Cook was to stay here for twelve days and made contact with the local Maori. Cook and some of the Endeavour crew were even invited to their settlement named the Wharetaewa Pa, being the first notable cultural Maori contact by any Europeans. Cook then spent just under six months circumnavigating the two main islands of New Zealand, and in so doing, proved this was not part of the presumed lost southern continent. 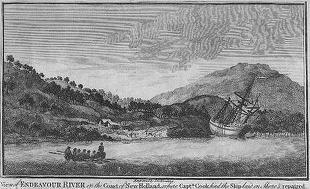 By 22nd January 1770, had Cook realised that New Zealand was two separate islands, being split into two by Cook Strait. The bottom of the North Island, is now the place of the capital of New Zealand, Wellington. Marking this is the western northern tip of South Island is the extraordinary deep-watered Queen Charlotte Sound or the Marlborough Sounds. Once departing New Zealand on 1st April 1770, he was ordered in his undisclosed documents to continued travelling due westward until he reached landfall. Only three weeks later, on 19th April, Cook first encountered the southern tip of the Australian continent, also known at the time as New Holland. Cook then decided to proceeded northwards, thinking he had reached Van Dieman’s Land now Tasmania. In days he quickly realised the Endeavour was too far north, but decided to keep travelling in the same direction. The expedition then journeying along the east coast over the next four months, and for the first time by Europeans, successfully mapping and studying this Eastern Australian shoreline. Cook’s Map showing the direction of travel and his navigation between New Zealand and Australia, between about mid-October 1769 and end-May 1770. He leaves from the north of the South Island in New Zealand along a WNW passage, then and about mid-track, then tacts WSW towards Tasmania (then known as van Dieman’s Land). It seems that unfavourable weather intervened, preventing travelling further south without considerable inconvenience. Instead of heading directly towards the middle of Bass Strait, along the rhomb line between the place of departure in New Zealand and Australia, Cook heads more northwards, meeting with the southern region of mainland eastern Australia at his named Cape Howe. In actuality, the southernmost point of mainland Australia is Wilsons Promontory (39°S, 146¼°E), being discovered by George Bass (1771-1803) in 1798. Could this be considered a possible strategic error made by James Cook? Had he stuck to his overall general plan, he would have found the island nature of Tasmania and probably would have explored Bass Strait. This would have been the coastlines of northern Tasmania and present-day Victoria; including the beautiful areas of Gippsland, Lakes Entrance, the Ninety-Mile Beach, and the safe harbour of Corner Inlet. Moving further west, he may even had discovered the relatively shallow, Port Philip Bay, the site of the Victorian capital of Melbourne. Was this known to the British Government, the history of the European colonisation of Australia and Tasmania may have been quite different. Details of only a few astronomical observations are available for us. These all appear in Cook’s Journal, and were mostly made for navigational purposes. During the night of 11th-12th June 1770, near present day Cooktown in far northern Queensland, the ship was almost damaged beyond repair. The Endeavour had struck the dangerous treacherous shoals and corals of the Australian Great Barrier Reef punching a sizeable hole in mid-ships, then to be wrecked on the now called Endeavour Reef. Limping near to the entrance of the Endeavour River, the ship was quickly unloaded, including all the cannons and most of the contents of the ship and many of precious collected specimens. For about seven weeks, the shipwrecked crew stopped for crude repairs to the Endeavour as best they could. Yet all was not totally lost, as the scientific crew took advantage of the break and usefully explored the local fauna and flora of the region. They also had an opportunity to investigate far more about Aboriginal peoples of the area. Endeavour River, in North Queensland, Australia. They soon passed through the dangerous waters of the narrow Torres Strait and then into the Gulf of Carpentaria — between York Peninsula and the large island of New Guinea. This again confirmed that New Guinea and the Australian mainland were divided by the Strait, allowing possible future passage from the Indian Ocean to the Pacific via this narrow but hazardous route. At the time this discovery was unbeknown to them, as the Spanish explorers had kept it very secret from the other competing European powers. This was the last time that Cook was to see mainland Australia / New Holland, though he again briefly landed in Tasmania during his second voyage. By 23rd August 1770, after taking four months to travel the 3,000-odd kilometres of the whole Australian eastern coast. Finally reached Batavia on 11th October 1770, they immediately began the work on a major refit of the Endeavour that include removing all the rigging and placing the ship in dry dock. The rest of the voyage home soon proved to be disastrous, as for the first time the crew succumbed to sickness and disease after about the 18th October. Almost all fell very seriously ill and three soon died from chronic problems like tropical malaria and dysentery. Much of this was later blamed on the poor hygiene and the local spoilt food they had obtained in Batavia. By 15th November the needed work had been completed, though the number of fit crew was reduced to about only a dozen men. Departing once again on 26th December 1770, the task to get home quickly was not helped by having about forty crew still very sick and almost incapacitated. In the first few weeks that followed, another eighteen more of the crew were to succumb, including the cook and the sail-maker. Of the scientific crew, one of the botanical artists, Sydney Parkinson (1745-1771) died on 28th January 1771, and on then on the same day, the main astronomer of expedition, thirty-five year-old Charles Green. Within one week, between 30th January and 6th February, twenty-four, or one-third the crew had been lost, making twenty-nine before reaching the safety of Cape Town in South Africa on 14th March. Here the exhausted expedition had to stop for a month to recover, but still another three more died. Exactly one month later, on 15th April, the embattled Endeavour finally began sailing northwards towards England. The remaining time of the long voyage was relatively uneventful, with Cook briefly stopping only at the small Atlantic island of Saint Helena on 1st May 1771. Endeavour then finally returns to Portsmouth on 13th July 1771 after 2 years, 10 months 18 days away. Upon the final return of the ship and the remaining crew, all were received and celebrated with great fanfare and aplomb. 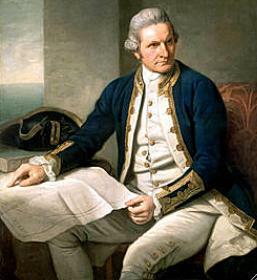 This immediately established the solid reputation and fame of Cook as the capable seaman, navigator and great British explorer. His many discoveries and land claims of eastern Australia and New Zealand, and many Pacific islands for the rising British Empire were ultimately to become both colonised or exploited for resources and towards their own purposes. In Australia, real occupancy of these new territories began eighteen years later in 1788 with the selection of Botany Bay as the first distant New South Wales penal colony. Other locations soon followed, in Tasmania, Western Australia, and the cities of Brisbane and Melbourne. The Transit of Venus of the 3rd June 1769 was considered of great importance. What was intended to be measured was the value of the Solar Parallax, representing the true apparent diameter of Earth as if it were placed at the very centre of the Sun, precisely 1.00 Astronomical Unit (A.U.) away. It was English astronomer Edmond Halley who had theoretically estimated that the solar parallax should be about 12½ arcsec, and this could be fairly easily determined from a planetary transit event using simple Euclidian geometry. Earlier on 7th June 1761, most of the transit expeditions scattered throughout the world had gained poor to very poor results. Obtained values were too inaccurate for determining any useful value for the solar parallax. An obtained mean parallax was published as 9.44±0.58 arcsec (ranging between 8.28 to 10.60 arcsec.) in 1761, being 7.4% too large against the currently accepted modern values. Lt. James Cook and Charles Green tried to improve this earlier failure and again made on 3rd June 1768 the necessary observations from Tahiti under difficult and stiflingly hot conditions. Again the results were inconclusive and again not too accurate — even with twice the number of observers! The limitation was later shown to be caused by errors in timing the four main contact points as Venus’ slowly crossed the edge or limb of the Sun. In the end, the application of all the classical Venus transit observations proved to be rather inaccurate than expected. They were, however, sufficiently accurate to produce rough measures of the estimated true distance between Sun and Earth — now is called the Astronomical Unit (A.U. ), which can be obtained much better by other methods. Today this theoretical value is about 8.794 arcsec, as now usefully defines the true scale of our Solar System. All Transits of Venus hold special interest for both Australians and New Zealanders, as Cook’s 1769 expedition of Venus Transit began during the rise of these now successful southern lands into the world we all now live. The British Admiralty had already clearly noticed Cook’s own strong passions towards natural history and science. So they appropriately selected him to undertake this important long exploration voyage. Highest in priority for the expedition was observations of the rare Transit of Venus from the island of Tahiti in South Pacific, from the Society Islands, now called French Polynesia. This main 45 km. long volcanic island was discovered by Samuel Wallis (1728-1795) in June 1767, but was also sighted by the Spanish in 1606 AD. For European eyes the location was simply paradise, helped in its wonder by its very friendly population of Polynesians. More importantly, it was ideal to observe the whole transit from start to end, where from Europe only the early stages of the transit would be seen. For the voyage, the only recognised astronomer was Charles Green (1735-1771) had been also appointed in 1768 by the Royal Society in London. Green’s career was rapid, and he rose in 1761 to the position of the assistant of the Astronomer Royal at the observatory site at Greenwich. He was directly recruited as mentally and physically suitable to join the arduous southern expedition of Cook and make observations of Venusian transit. This he was to successfully accomplish on 3rd June 1769, under very difficult conditions, and especially as the day for much of the transit was unbearably hot. Matters, and probably nerves, were made worst when on the day, some of the important observational equipment before the astronomical event was deliberately stolen by some of the local Tahitian inhabitants. No doubt they were attracted with the brilliantly shiny brass metal of the telescopes, and the ancillary parts, like the eyepieces and some of the mount. According to the records of the Voyage, it took some significant delicate negotiation for its safe return. Observationally, both Cook and Green were required to obtain, on behalf of the astronomers at the Royal Observatory in Greenwich, the much needed accurate timings of all four main planetary contact points — the times of the two ingress and egress points, occurring during the very beginning and end of the transit event across the solar disk. Across the path of the sun, the entire line or chord that joins the ingress and egress points were of superficial astronomical significance to the expedition, even though we know that the observations of the general appearance of Venus and its surrounding atmosphere were proved to be crucial factors in ascertaining the exact moments of the times of solar contact. These four timings needed to be exact to fractions of a second, as they were required to accurately measure the value of the solar parallax — a physical observational quantity not well established at the time. These observations of the solar parallax were ultimately needed to precisely measure the true distance between the Earth and Sun — the so-called astronomical unit (A.U.) Since earlier expeditions to observe the 1761 Transit of Venus had gained only modestly successful results, the observations of the next 1769 transit had by necessity, became considerably more important. Immediately after the 1761 event, astronomers soon realised that all the obtained results were far too diverse to be used for any definitive value for the solar parallax. I.e. 9.44±0.58 arcsec — which we now know is some 7.4% too large. Considering that Edmond Halley boldly predicted that the transit could be predicted to 0.015 arcsec, the astronomers became scornful of the seemingly poor abilities of the observers instead of blaming the observational conditions that were contributing to the transit itself. They also realised that any failure at these expeditions, and the astronomers would have to wait again for their next opportunity in either 1874 or 1888, so dutifully the astronomers requested to their governments, that the number of transit expeditions worldwide had to be doubled. (A summary of the importance in determining the appears in the side-box (above). Also see my more detailed planetary article on the planet Venus with a more definite explanation of the nature, future and past occurrences of the Transit of Venus. “Wednesday, 8th, p.m.: Fresh breeze at N.N.W., and hazy, rainy weather; the remainder a gentle breeze at W.S.W. and clear weather… At noon I observed the sun’s meridian, zenith distance, by the astronomical quadrant, which gave the latitude 36° 47′ 43″ S.; this was in the river before mentioned, that lies within the south entrance of the bay. After Cook’s exploration and promising report about the eastern coast, another English follow-up voyage to Australia was again considered during 1787. It was then decided it might be worthwhile to establish the first Colony on the island continent to claim this distant land for ‘king and country.’ Command of this First Fleet was placed with Captain Arthur Phillip (1738-1814), whose flotilla of eleven ships  set sail from Portsmouth on 13th May 1787. After stopping for additional supplies at Tenerife in the Canary Islands (3rd June), Rio de Janeiro (5th August) then the Cape Town (13th October), the expedition finally set off for Australia on 11th November. All the naval crew and convicts arrived from England to their ultimate Australian destination on 20th January 1788. So the Colony henceforth was known as New South Wales, where Phillip accepted his role as its first Governor. Capt. 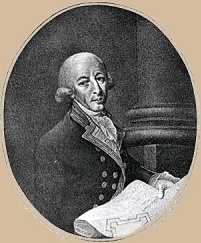 Arthur Phillip from the HMS. Sirius, being the largest among ten other ships. Following some two weeks after leaving Cape Town, he soon transferred to the much faster ship, the HMS. Supply, taking with him the necessary experience of Lt. William Dawes. His reasoning behind splitting up the ships was to formally establish the suitable place for the new Colony, and to do so prior to the arrival of the main fleet. As it turned out, the HMS. Supply arrived on 18th January 1788, only two days ahead — leaving not much time for good reconnoitring and assessment. Capt. Phillip quickly rejected the original site first selected by Cook some eighteen years earlier. Botany Bay seemingly was too open from the weather and deemed quite unsuitable, probably because of the sandy soil. Also militarily the place was not defendable by attacks from the sea by other possible European countries keen on establishing their own new settlements. After the quick reconnaissance of the nearby foreshores, an entrance was found some twenty kilometres further north. This exposed for the first time the vast and spectacular Port Jackson, now famously renown as Sydney Harbour. James Cook, in his general haste to ever explore northwards, had amazingly not really paid much attention to the wide gap between the 100 metre high sandstone cliffs and the two prominent sandstone heads at its entrance, often named the Sydney Heads or just ”The Heads”. So he noted it, and just sailed by, so missing out on one of the most important harbours along the Australian eastern coast; and probably one of the very best in the known world. On this first voyage, six transport ships of the flotilla carried some 717 convicts; 564 men and 192 women, but did also included many unrecorded children. Also departing from England were an additional 290, consisting of sixteen Officers, twenty-four Non-commissioned Officers (NCO’s), 160 Marines, with an additional forty free women. Only fifteen people had died during the whole eight-month journey, and all of these were convicts. Three ships of this large flotilla were solely dedicated stores ships and were adequately stocked with sufficient short provisions, along with livestock, sheep and suitable basic construction equipment. One of the main reasons for selecting the ideal site for the Colony was the Tank Stream, which provided decent and plentiful fresh water. The locality selected also had one large and heavily wooded area of tall white gum trees that provided enough initial building materials and at least some suitable cover. The first few years were fraught with many difficulties, including conflict with the local native aboriginal inhabitants and to establishing food production using quite inadequate European methods for the climate. Several seasons of agricultural failures lead to almost complete starvation within the early Colony, almost ending it before it began. Both the soils and terrain for the most part were sandy and poor for growing crops, but after much local exploration, new farming communities were established some twenty-three kilometres further west of Sydney, which Philip had named, Rose Hill. Today this area is centred on suburban Parramatta, at the time spelt “Paramatta”, being likely named after an aboriginal word meaning “place of eels”), and lies where the Parramatta River now ends. This site was an ideal choice by Capt. Phillip, who already had some farming experience. After about ten years, roughly starting around 1800 AD, the new Colony of New South Wales became official and permanently established. Once on its feet, Sydney became an important and useful South Pacific port that could offer repair facilities for ships and replenishment of fresh food and clean water. So the region began to rapidly expand, then commenced to prosper and thrive. Soon Sydney, sometimes optimistically referred to as the Emerald City of the South Pacific, became the central hub of the first white European settlement of Australia. After this the whole country of Australia soon set upon its new course of prosperity, rising up as one of the cosmopolitan, rich and celebrated young countries of the modern world. Fig. 4 shows the place of the Dawes Point Battery and the site of the Sydney Observatory atop of Observatory Hill. This map has been adopted to show Sydney as it appeared in the 1850s, and shows the mostly unchanged outline of the harbour foreshore. Compared to the current Google map embedded in Fig. 5, there has been significant modification, especially within the port area on the western side, and the shape of Sydney Cove now known as Circular Quay. Position of Dawes Observatory now is placed mostly under the south-western pylon of the Sydney Harbour Bridge, since the end of the 1920s. Incidental Note: Street directions and orientations are much different from the 1850s to today, which seems a little bit odd. It seems the original drawing suggests better city planning than what is true. have been the first on Australian soil. On 24th January 1788, and only days after Captain Phillip had arrival to establish the new Colony, the French explorer and expert navigator, Captain Jean-Françis Galoup, Comté de La Pérouse (1741–c.1788) (or hereafter, just named Lapérouse), sailed into Botany Bay, some twenty-two kilometres south of Sydney. Along the northern sheltered side of the bay, La Pérouse set up a small stockade for about four weeks between February and March, so that they could search and store additional supplies of wood and water, then explore the general region. At first, Philip thought this might be the establishment of another new rival settlement, but these fears were soon belayed, as Lapérouse told his was just a temporary stay and they were doing scientific research. Importantly, and central to our story here, Lapérouse had erected his defensive stockade around some kind of temporary astronomical observatory. The only results during the first week of observation seem to be in determining the exactly the latitude and longitude of Botany Bay. These were later shown to be just as precise as those of Captain Cook, who was the first European to discover the open bay. After this brief encounter, we know nothing more of this grand ill-fated French expedition. All letters or observations that were made after they had departed Botany Bay were lost forever, as both of ships; Lapérouse; the 500-ton Boussole and its sister ship L’Astrolabe, were tragically shipwrecked together, with the apparent loss of all hands. This probably occurred during a severe South Pacific tropical cyclone that they had encountered sometime in late-March or early-April 1788. Historically, the loss of this expedition on our knowledge of very early Australia is heartbreaking, especially towards their scientific discoveries. It is something that remains tantalising of having a different perspective of this newly discovered land by the Europeans. We know little about the construction or true size of these observatories. All that exists is a two-page handwritten letter containing some rough drawings that was made by William Dawes and sent to Nevil Maskelyne on 30th April 1788. The location of much of this site now lies just north of the southern pylon of the famous Sydney Harbour Bridge, and remained inaccessible until an archaeological dig in 1995, being undertaken by Wayne Johnston. Although any remains of the once canvas-roofed observatory is now non-existent, the site still has the remains of the fort known as the Dawes Point Battery. Little observational astronomy, however, was made at this location, which began in September 1788. No astronomy related observational records exist, except for several letters and various snippets of meteorological observations. As previously said, one of the main functions was to fix the latitude and longitude of the Colony. Using the stars, this was later achieved with sufficient accuracy in 1789 by Captain John Hunter (1737–1821) and Lt. William Bradley (c.1757–1833) at the same observatory site. Lack of astronomical work was not at all surprising, especially as the new arrivals were struggling to provide enough locally grown food and even secure regular supplies of drinking water. So desperate was situation that severe rationing was required. On several occasions the early stages of the Colony were close to total collapse. Among the aims of this observatory was in obtaining the position of the southern return of a possible periodic comet. This was first predicted by Edmond Halley (1656–1742), which he expected was to return in about 1790. (This, however, was not the now famous Halley’s Comet as some common references often state). Again this had been requested by the then Astronomer Royal, Dr. Maskelyne, who had submitted directly to the Naval Board that Lt. Dawes should be properly supplied with suitable telescopic equipment to find and observe this comet. Throughout 1788, Dawes had searched without luck in finding this predicted comet, eventually writing his disappointing failure to Dr. Maskelyne on the 17th November 1788. A later explanation for this missing comet was that Edmond Halley had incorrectly assumed that the original comet observed in 1532 was the same as another discovered by the German astronomers Peter Apian (1495–1552) (Pertrus Apianus, Appian, or sometimes even the Latinise name, Aphrodisius / Petri Aplani) and Johannes Hevelius (1611–1687) during 1661. Halley had based this postulate on two different comets with quite similar calculated orbital elements, and on the apparitions of both of these, concluding the long orbital period was 128.25 years. Next predicted apparition he formally concluded would be in either 1789 or 1790. Although this celestial event was never observed, it was much later calculated to have presumably returned in 1835. It is most probably the observed errors in the initial celestial positions made by Apian were the real cause of the miscalculations with the expected cometary orbit. It is also possible, though, that significant planetary perturbations, caused mostly by the outer planets, were possibly the main contributing factors to the calculation error. Another prominent astronomical outcome for Lt. Dawes was to correctly establish the longitude and latitude of the Colony, which could then be used for local timekeeping. His positions were calculated by the end of April 1788 as; Latitude; 33° 52′ 30″ South & Longitude; –151° 20′. Lt. Dawes first observations were also importantly used in resetting the ship’s chronometer. This was needed for crucial navigation purposes upon the eventual return to England of the entire flotilla of ships. Dawes observations soon found, for example, that the main chronometer on the HMS. Sirius was losing about five seconds per day. This useful information could be adopted to interpolate the necessary corrections to the navigator on the long journey back home or further exploration of the region by other expeditions. Dawes minor scientific works was also included various meteorological measures and observations. These unpublished series of observations were mostly made between 1799 and 1791, and were somehow lost until 1977 when the documents were accidentally found in the archives of the Library of the Royal Society in London! Still more may be found in the future. 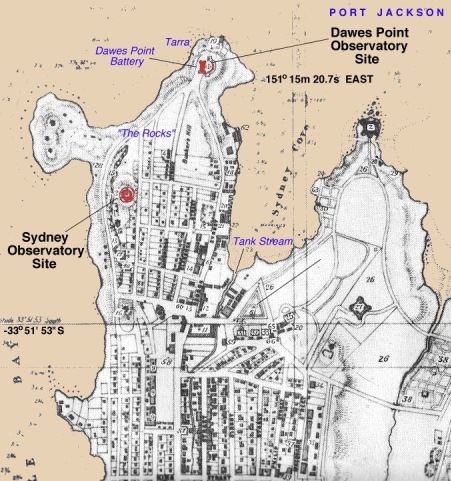 Lt. Dawes was also to be in charge of the small garrison, whose extended duties often required to actively participate in exploring and surveying the whole Sydney Basin. He produced in March 1791 a very useful map of the general area that included Botany Bay to the northern Broken Bay, the Parramatta River, and out to the eastern edges of the Carmarthen Mountains, or today’s Blue Mountains — some fifty kilometres further west of Sydney. (See National Library of Australia “A map of all those parts of the territory of New South Wales which have been seen by any person belonging to the settlement established at Port Jackson…” (1792)) He reached inland as far as the Grose Valley on 14th December 1789. Also, some basic positional work was made at Sydney’s South Head into Port Jackson at latitude 33° 50′ and longitude 151° 28′E At the South Head of Broken Bay (now called Palm Beach), he determined the latitude as 33° 34′ 36″. William Dawes also first established a useful lexicon of the local Eura aboriginal language known as Dharuk. The physical existence of this observatory was last officially recorded in August 1795. It was the Dutch explorer Able Tasman (1603-1659) who first sighted Tasmania on 24th November 1642, but he attempted no landing nor confirmation of connection to the main Australian continent to the north. Later James Cook (1728-1779) again sighted Tasmania in 1777, while he was meticulously navigating across the Southern Ocean looking for the fabled Great Southern Continent. In 1797, George Bass became to be the first to discover Bass Strait, finding Van Diemen’s Land was an island detached from mainland Australia. Astronomical observations, at the time, was mostly achieved at sea from the rolling deck of the ship, gained solely for navigation and for determining geographical coordinates within the vast southern oceans. Mostly these early expeditions were mostly for exploration or commercial exploitation, whose aims were not truly aimed just for human colonisation or settlement. During these voyages the most interesting astronomical phenomena would have been seeing occasional solar or lunar eclipses that would have been of interest to the astronomical community. However, looking through the general historical records, no eclipse was to occur during either sightings of the southern Tasmanian coastline nor on these voyages, so they do not really count in the development of Australian astronomy. Most of the east coast settlements were confined to southern island of Tasmania. Claiming Tasmania as another Colony for the British Government, Lt. John Bowen (1780-1827), planted the British flag at Risdon Cove in the Derwent estuary on 12th September 1803. This site proved to be a poor choice, so another, also on the Derwent, was established at Sullivan’s Cove in February 1804. This place was to be named Hobart Town, to be changed to the current Tasmanian capital city name of Hobart. In December 1800, and concurrently with Tasmania, it was the 60-ton ship Lady Nelson, under the command of navigator Lt. James Grant (1772-1833), which became first to pass (west to east) through the then recently discovered Bass Strait. This 220 kilometre stretch of water, divides the mainland (later Victoria) from Tasmania, whose average depth averages about fifty to sixty metres. 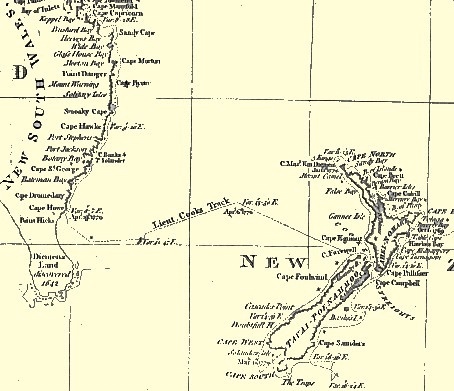 On his initial arrival in Sydney on 16th December, Lt. Grant passed on his knowledge to the New South Wales Governor Philip Gidley King (1758-1808), who then instructed him to explore the north and south coasts of New South Wales. Leaving on 6th March 1801, John Murray then discovered Port Phillip Bay in February 1802, the site of Australia’s second largest city and first national capital, Melbourne. Ten weeks later, the navigator Matthew Flinders (1774-1814) had entered the Bay. Flinders, then only twenty-eight years old, used Sydney as his starting point. He then sailed between January 1801 and June 1803 and became first to circumnavigate Australia  in a clockwise direction in an attempt to finally understanding the size and shape of the whole continent. Although he, like Cook, was shipwrecked while trying to navigate the corals of the Great Barrier Reef, Flinders importantly established the most suitable locations for any future new colonies or towards promising new commercial opportunities, like whaling. In October 1803, entering Port Philip Bay and preceded to the mouth of the Yarra River. They then attempted to settle the region, by beginning the necessary improvements using the assigned British convicts. This attempt was soon abandoned within months ending in May 1804, mainly due to lack of sufficient local resources, like suitable building materials, decent timber and a good supply of fresh water. Melbourne was later finally to be successfully settled in June 1835 by the Australian born John Batman (1801-1839), who was granted some useful land for farming on either side of the banks of Yarra River that now passes through the centre of Melbourne. On the western coast of Australia, this was first visited by Europeans on 26th October 1616 by Dutch sailor, Dirk Hartog (1582-1631). He landed on an island at today’s Cape Inscription on Dirk Hartog Island. Other Europeans travelled intermittently along the west coast — mostly by accident, but they never stopped to explore for any length of time. The British, wanting to secure ownership of the whole continent all for themselves, then settled another new colony at Albany in 1826 on the southern coast of State of Western Australia. By 1829, a second western colony was established on the Swan River now known as Perth — the capital and largest city in the State of Western Australia. By the 1830s the Colony of New South Wales was thriving, driving an ever expanding occupation of the Australian coastline. At this time the Colony was on the early cusp of the important exploration of the whole inland continent. Perhaps the only astronomical observation of possible interest being made here, were from the small number of explorers who happen to pass through en route to islands of the South Pacific, or those decided to land or explore the coastal strip of the continent. Perhaps the most significant astronomical event of the times was marked by the total eclipse of 27th September 1791. Although it did occur, it is still uncertain if anyone was inside the narrow path of totality. It was also on the day when two of the nine ships of the Third Fleet, being the Active and Queen, arrived in Sydney on 26th September 1791. However, no available document records states or notes any partial eclipse. Captain Matthew Flinders (1774–1814), who was the first to circumnavigate the whole continent, also was to formally coin the use of the name Australia He stated in 1804, “I call the whole island Australia, or Terra Australis.”. Although it seems the brilliant British navigator Alexander Dalrymple (1737-1808) wrote the name for the first time in his 1771 book, it was Flinders who promoted the final given name of the continent until his early death in 1814. Officially in 1824, when British Government had formally claimed sovereignty over the whole island continent, the given name of Australia came into official use. To be this was to be only rubber-stamped by the British Admiralty. Since this time, the name continued to be used to describe the smallest of the continents, and the only one whose whole boundary is held by only one country. Every since, Australia has risen to share its place among the many nations as one of the newest international countries and now holds its own unique place in the world. It is also interesting that in 1826, Sir Thomas Makdougall Brisbane (1773–1860), being the sixth Governor of New South Wales, gave his baby daughter’s middle name as Australia — no doubt to celebrate the birth of this new country under British rule. If there was a threat of the enemy obtaining this confidential information, he was told to immediately destroy it! There were eleven English ships in the First Fleet were the; Alexander, Borrowdale, Charlotte, Fishburn, Friendship, Golden Grove, Lady Penrhyn, Prince of Wales, Scarborough and Supply. Command Ship: Under Philip ’s command, was the flagship Sirius and the largest ship of the whole flotilla. Transport Ships: Alexander, Charlotte, Friendship, Scarborough, Lady Penrhyn and Prince of Wales. Store Ships: Golden Grove, Borrowdale, Fishburn. As an interesting footnote to this story, is that Lt. Dawes once invited La Pérouse’s French equivalent, M. Joseph Lepaute Dagelet (1741–1788), to inspect the new colonial observatory being constructed at the time of his visit. Dagelet had to decline, possible due to ill health from the long journey to reach the Sydney Colony. 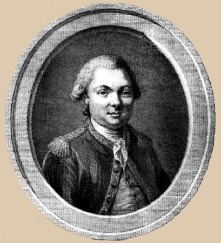 Yet in general conversation with M. Charles Fantin de Boutin (1760–1788), he had told Dagelet of Dawes’ general plans. Correspondence between these two astronomers appears in a letter written on 3rd March 1788 to Lt. W. Dawes (See on-line at; Letter Transcript. An image of the original document “1788 from Dagelet to Dawes” (in French), or at the State Library of New South Wales at; Astronomer’s letter. This wonderful piece of correspondence reads like some friendly conversation between two people who were very passionate about their similar branches of scientific interests. This letter appropriately discusses some of then recent astronomical problems being faced by navigational or positional astronomers of the day. A tantalising short article on how this letter was found once appeared in The Sydney Morning Herald newspaper of 15th August 2005. Norris, R.P., Hamacher, D.W., “The Astronomy of Aboriginal Australia” Proceedings IAU Symposium No. 260, “The Rôle of Astronomy in Society and Culture” (2009) Pub. D. Valls-Gabaud & A. Boksenberg, Eds. Dawes, Lt. W., “A map of all these parts of the territory of New South Wales which have been seen by any person belonging to the settlement established at Port Jackson…”; National Library of Australia; MAP NK 2456/126.